The site is organized by scientific name, but you can find things through the directory of common names too. You may also find the introduction to the taxonomic classification system helpful. 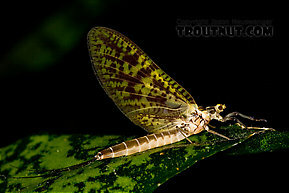 Mayflies are the most important insects for anglers to understand, because they are common on trout streams, they often hatch in frenzied bursts of activity, and their behavior varies so widely between families and sometimes even species that it's useful to know and imitate the habits of each. They are a primitive order of insects, and their elegance and delicate lives have made them popular beyond the world of trout fishing. 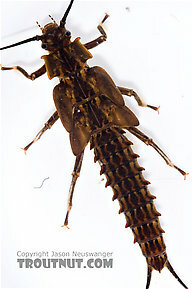 Though less prolific than mayflies and caddisflies, many stonefly species make up for in size what they lack in numbers. 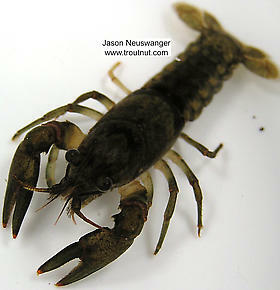 Because they emerge by crawling out of the water on land, the hatching adults are not eaten for trout, but their large nymphs are welcome food year-round. 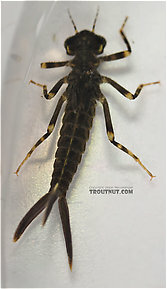 In the Western states, where stoneflies are most prolific, trout sometimes feed selectively on the egg-laying adults as they return to the water. 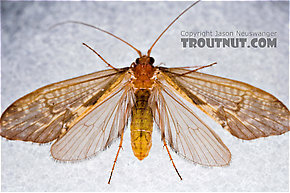 Some anglers consider caddisflies to be even more important than mayflies, and on many rivers they're right. Angler-entomologists focus less energy on them because they are slightly less prone to cause a feeding frenzy among the trout. While that does happen, they are more commonly an intermittent food source during the times when it seems like nothing's hatching. Understanding their life cycle is of paramount importance to any fly fisher, but learning their quirks species-by-species is less useful than with mayflies. 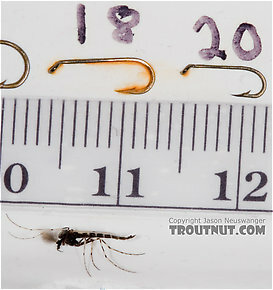 Midges are most popular with anglers who fish fertile, placid spring creeks and stillwaters. Their often tiny size frustrates anglers who encounter trout feeding selectively on their frequent hatches. Their many thousand species are impossible to sort out, but they all share similar stages and behavior as far as the angler is concerned. Dragonfly adults are very rarely vulnerable to trout because they are superb at flight, but their large, slow nymphs are welcome food. The adults and nymphs are both impressive predators upon other insects, and I have watched adult dragonflies kill large mayfly duns and tear through a cloud of midges at rate of several per second. Damselflies mirror the closely related dragonflies (scientifically, they are different suborders of the order Odonata) in that the adults are excellent at flight and only the nymphs are likely to fall prey to trout. 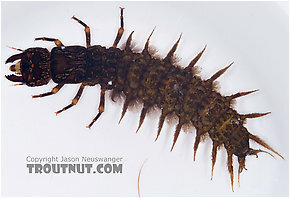 Their nymphs differ in the way they look, move, and respirate, but they share the same alpha predator status in the world of aquatic insects. Beetles are the largest order of insects, and their many species come in contact with trout in three ways. The most popular among fly fishers are the species which live on land and occasionally fall or get blown into the water. But some species live their entire lives underwater, and still others live underwater only as larvae with a wide variety of unusual shapes and habits. 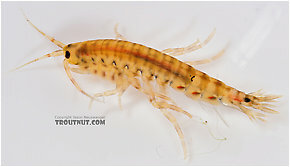 Scuds are not insects but small crustaceans, sometimes called freshwater shrimp, and in some streams they are a primary food source for trout. They grow quickly and can survive in a variety of habitats, but they are most prolific and important to trout in slow, weedy spring creeks. 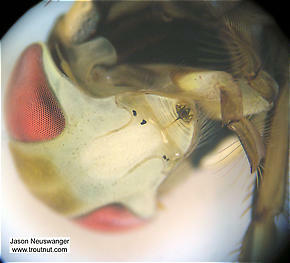 Unlike most aquatic insects, they never "hatch" into a dry form. Water boatmen are in the order Hemiptera, the "true bugs," along with water scorpions, giant water bugs, and backswimmers. 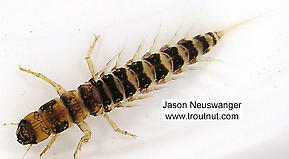 They are present in many trout streams but are more important as a food source in lakes and spring ponds. 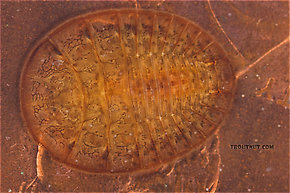 The nymphs and adults look similar and the adults cannot breathe water, but carry small air bubbles with them for respiration. They sometimes fly up out of the water in the early season to mate, leaving anglers witnessing a very confusing "hatch." Crayish require no introduction, but their importance to trout is often understated. They are a favorite of many large freshwater gamefish, and trophy trout are no exception. 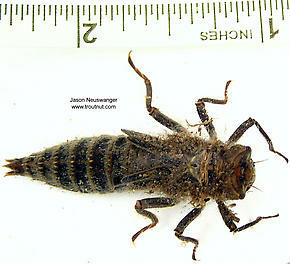 Dobsonflies and their predatory larvae, the hellgrammites, are among the largest trout stream insects. They are best known as a good excuse for the rigid imitationist to fish a wooly bugger.